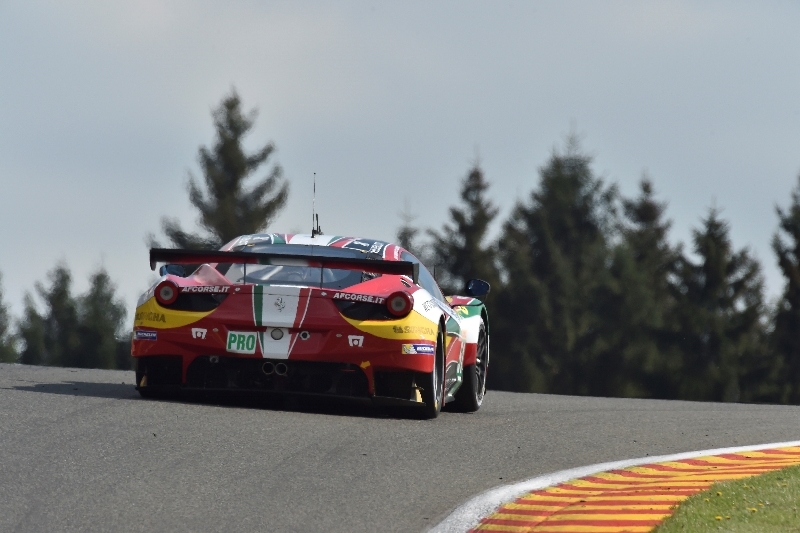 Spa-Francorchamps, 3 May –It didn’t take long for Ferrari to make up for the disappointment of the opening round at Silverstone of the FIA WEC (World Endurance Championship) today at Spa-Francorchamps. 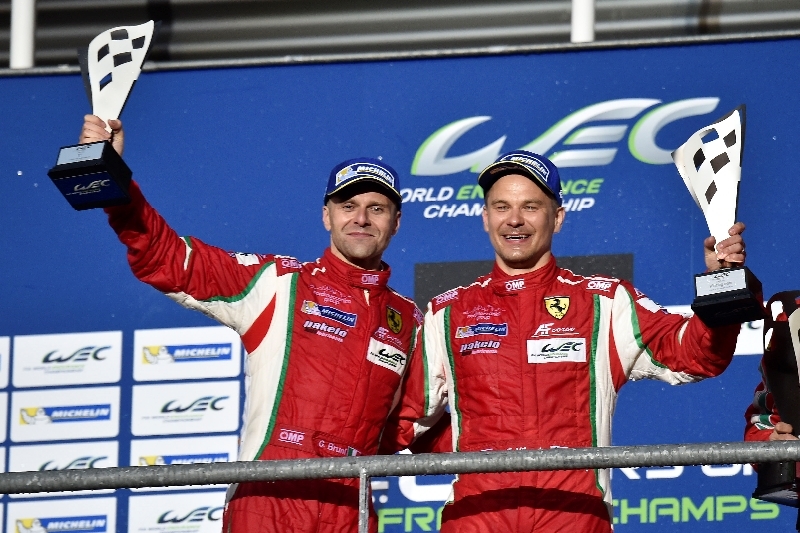 This time, world champion, the Italian “Gimmi” Bruni and Finland’s Toni Vilander left their rivals in no doubt in the battle for LMGTE Pro honours from start to finish. 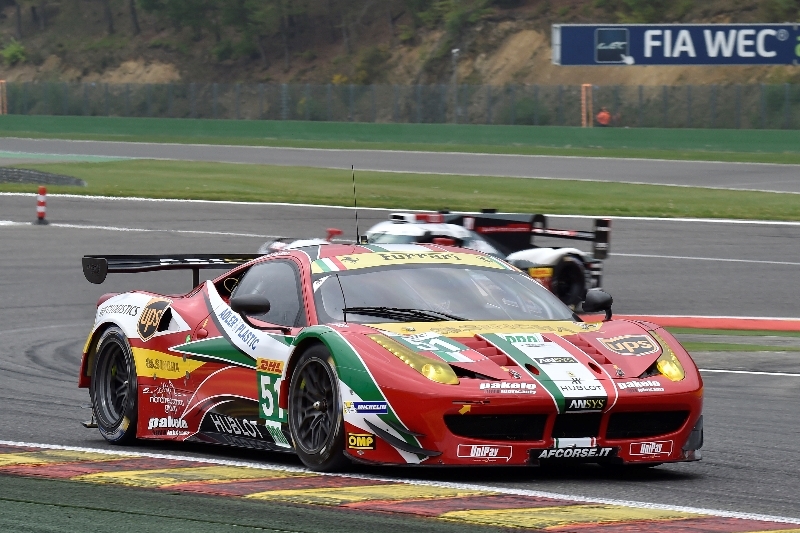 They crossed the line to give Ferrari its eleventh endurance win in the Ardennes. 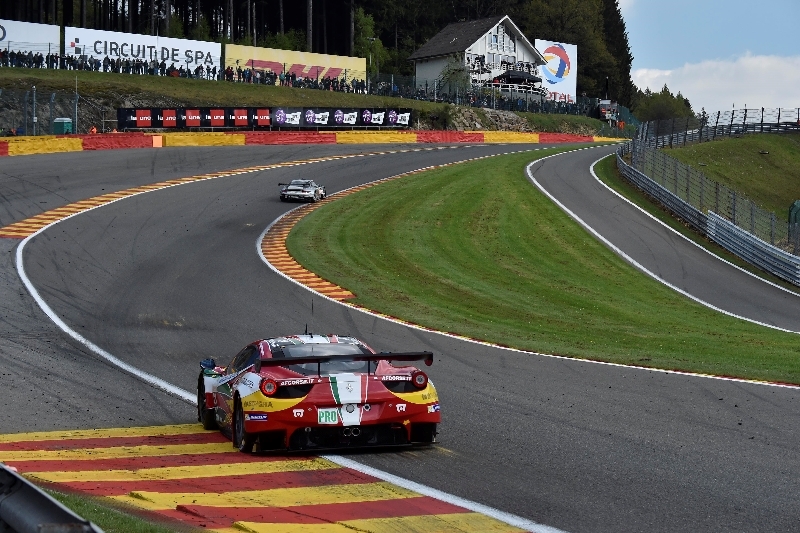 Only once did car 51 lose the lead, but it was all part of the strategy and down to pitting at a different time to its main rivals. In fact, Bruni had no problem keeping his pursuers at bay, led for a long time by the other AF Corse 458 Italia GT2, in the hands of the young crew of James Calado and Davide Rigon. 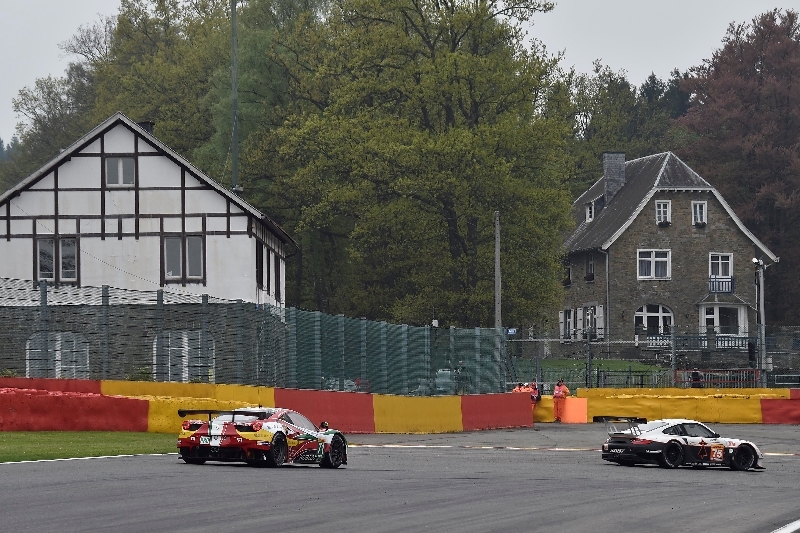 In the last half hour, it was in fact Rigon who came under strong pressure from the Team Manthey Porsche, driven by Jorg Bermeister and Patrick Pilet. 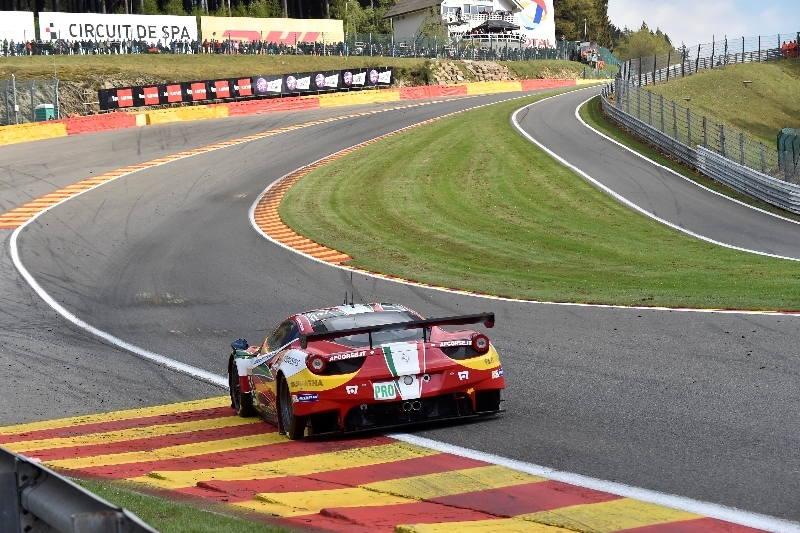 With a few minutes remaining, the Frenchman managed to force Rigon into making a mistake under braking for the downhill Rivage hairpin. 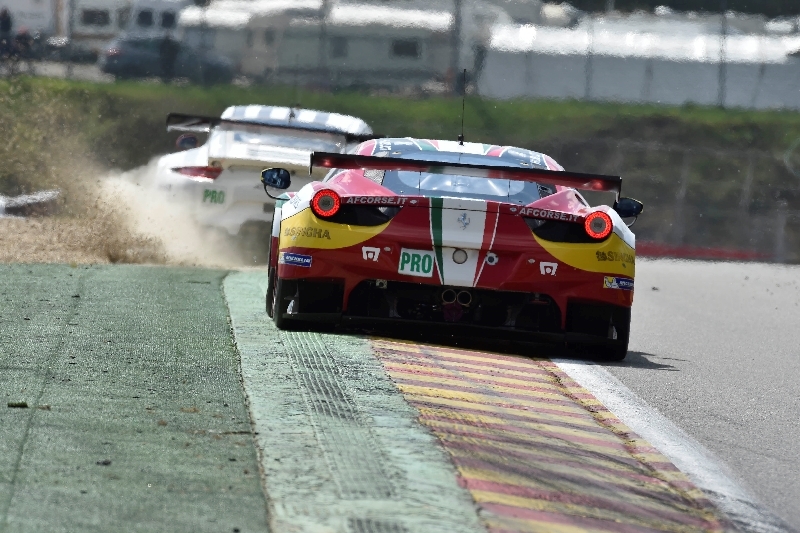 This meant there was a big enough gap for the Frenchman to get by and head home for second place. 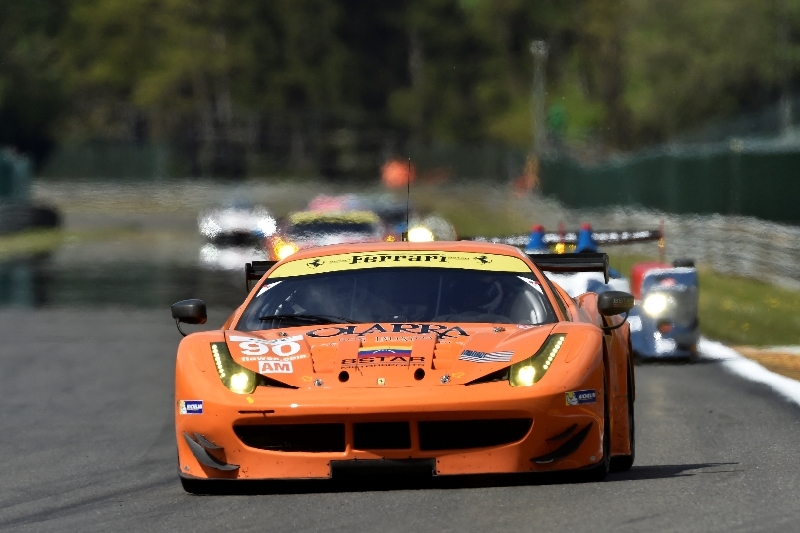 All the same, Rigon and Calado’s third place was a significant result in only the second race of their partnership. 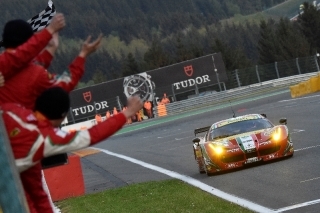 There was also cause for celebration in the LMGTE Am class, in which Ferrari secured a twelfth Spa win. 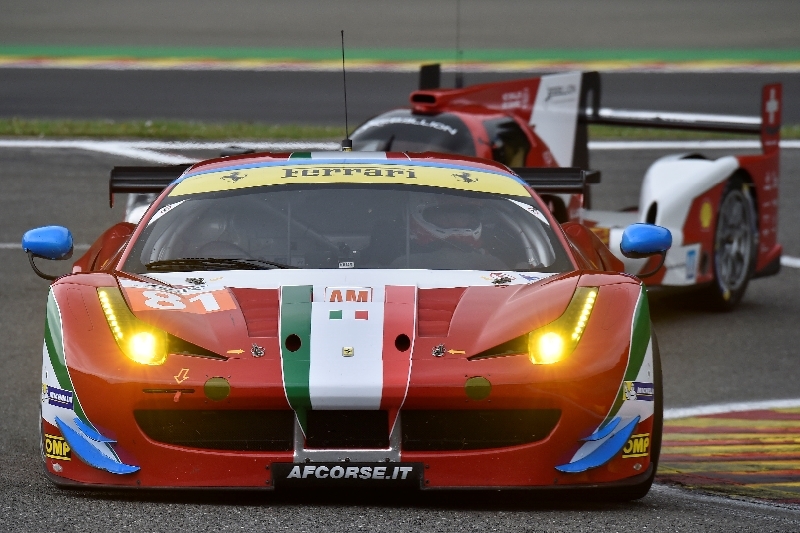 That went to the crew who had saved the day for Maranello back in Silverstone, the AF Corse car 61 driven by the Italian duo of Marco Cioci and Mirko Venturi, teamed with Argentina’s Luis Perez-Companc. 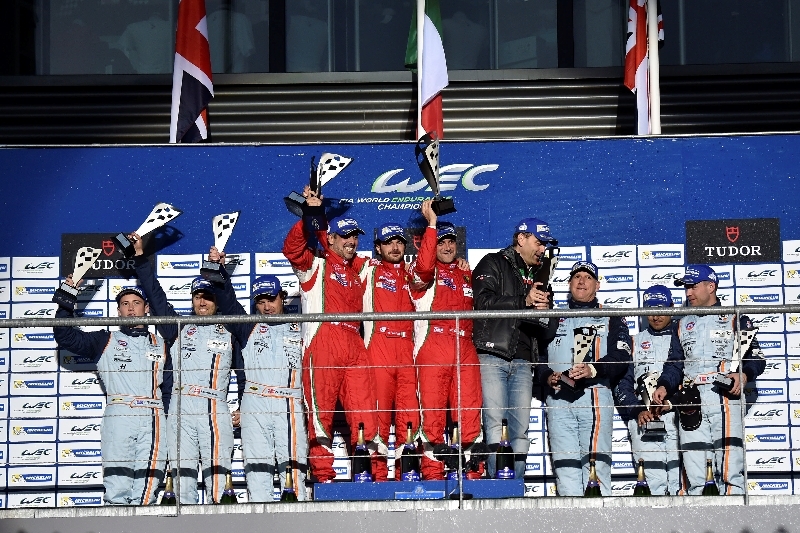 They managed to see off the attentions of the two Aston Martins which also made it to the podium. The other Ferraris in the category finished fifth with car 81 (Wyatt-Rugolo-Bertolini,) seventh (car 60 for Giammaria-Mann-Casé) and eighth (car 90 for the 8 Star Motorsport team,) which at one point lost a wheel. 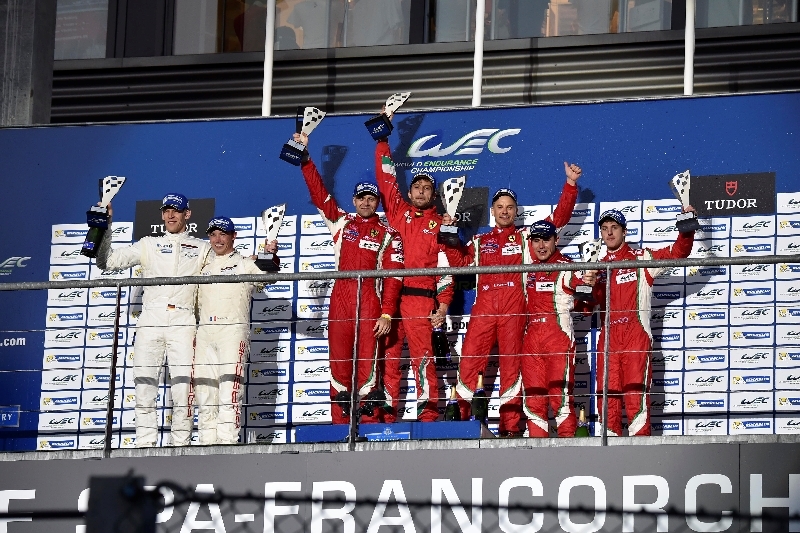 The overall winner of the race, just as in Silverstone, was the Toyota of Anthony Davidson, Nicolas Lapierre and Sebastian Buemi. 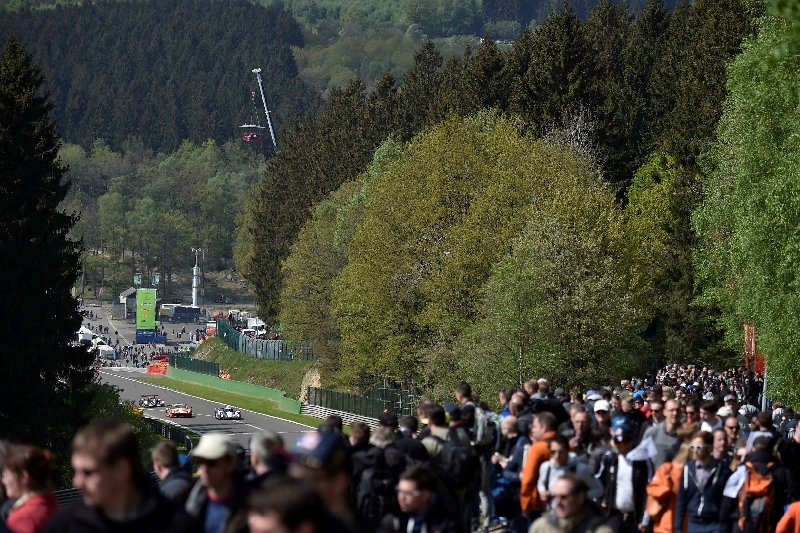 The next round of the WEC is the highlight of the season, the Le Mans 24 Hours, on 15th June at the legendary and eponymous French track. 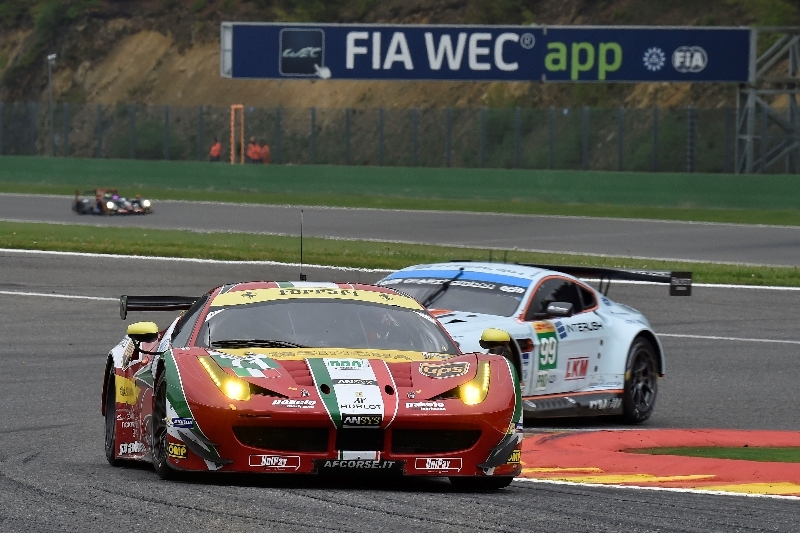 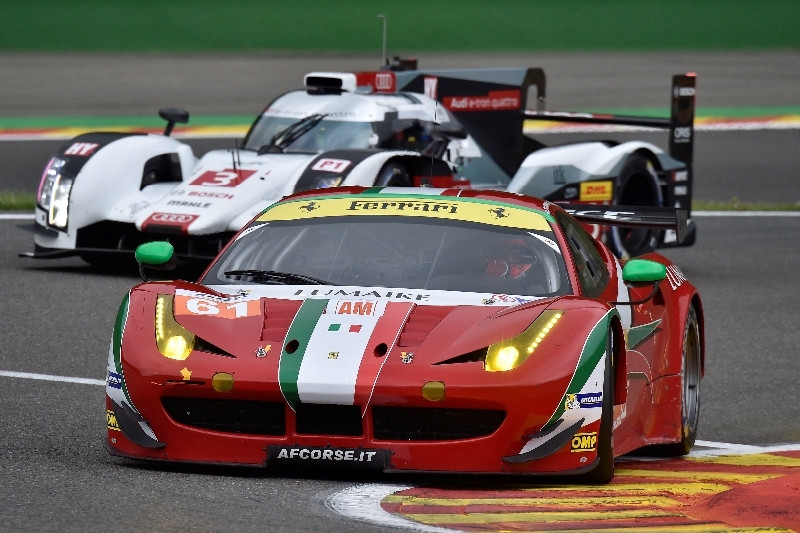 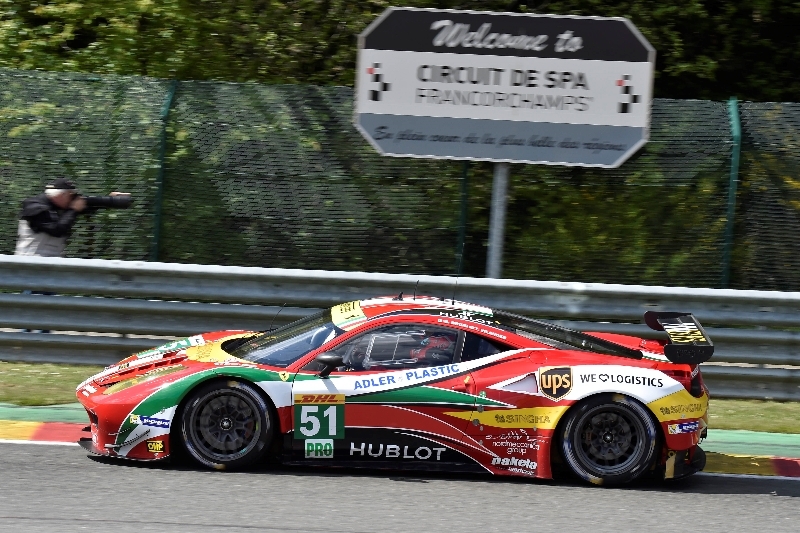 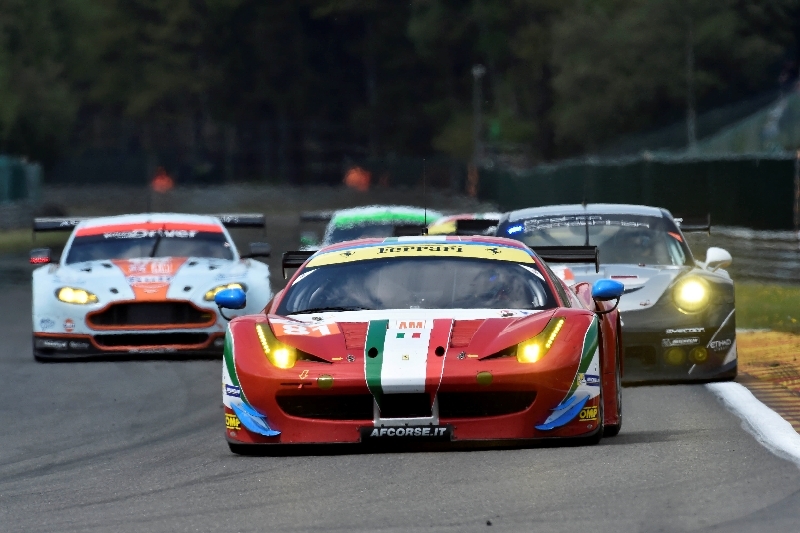 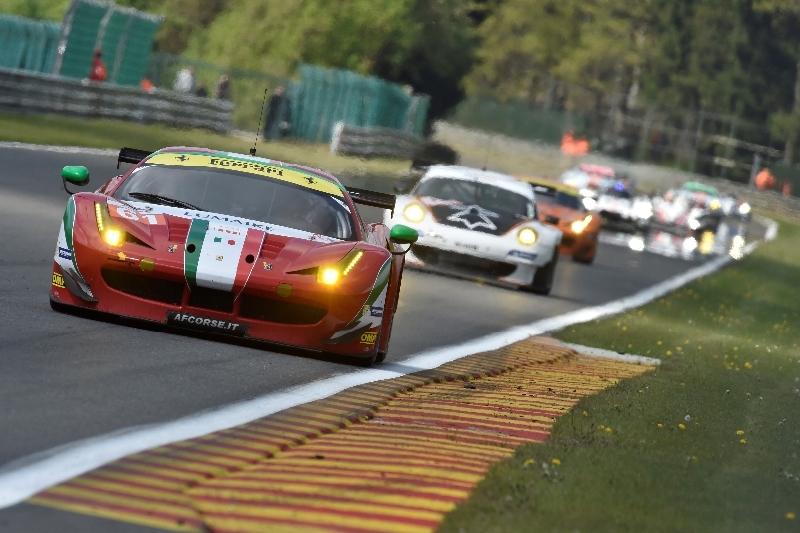 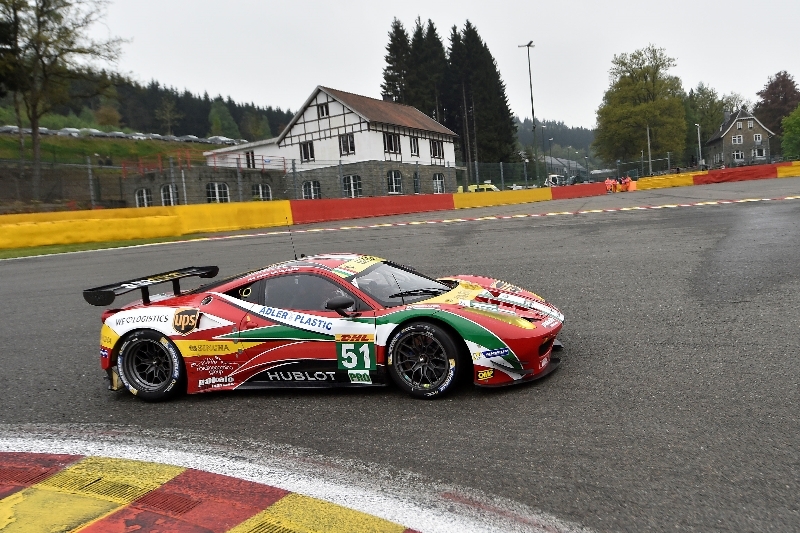 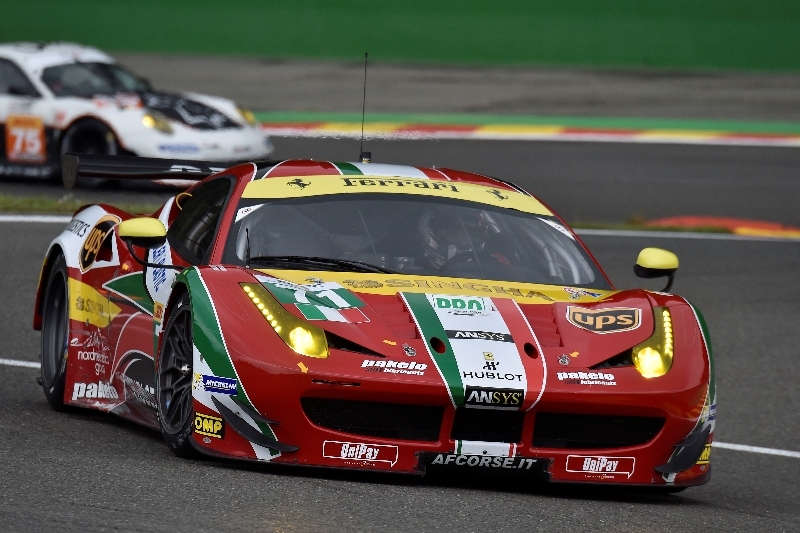 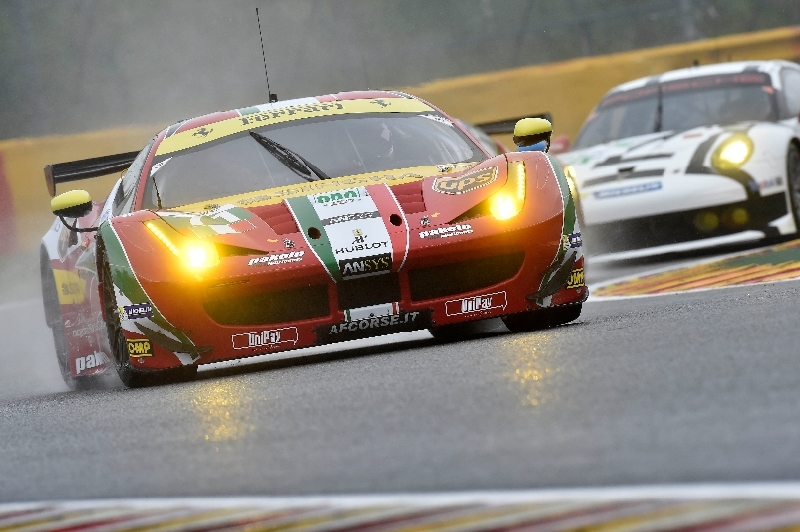 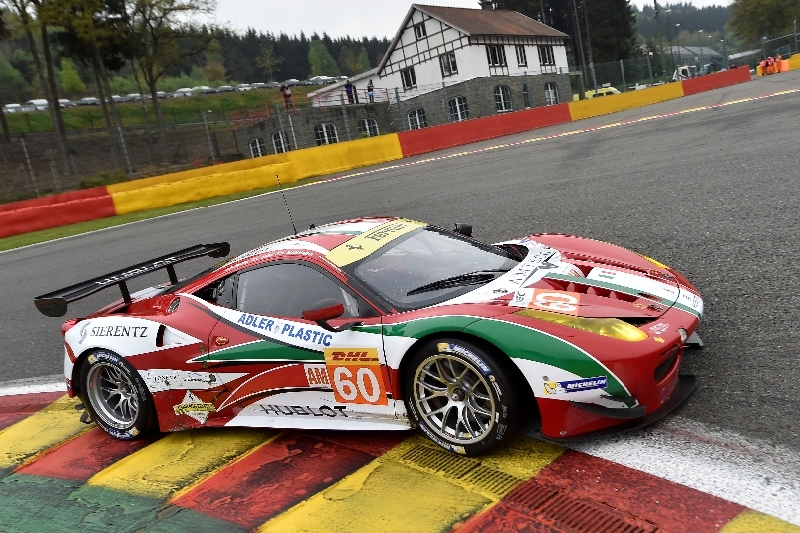 Spa-Francorchamps, 2 May –There was a brace of pole positions for the AF Corse Ferrari 458s come the end of qualifying for the second round of the FIA WEC, the world endurance championship. 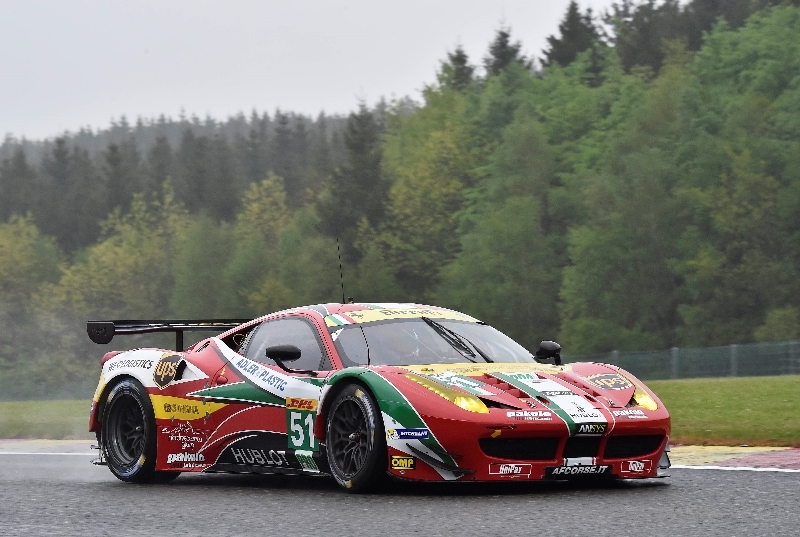 In the LMGTE Pro class, world champion “Gimmi” Bruni and Finland’s Toni Vilander will start ahead of the field for the second race in a row in car 51. 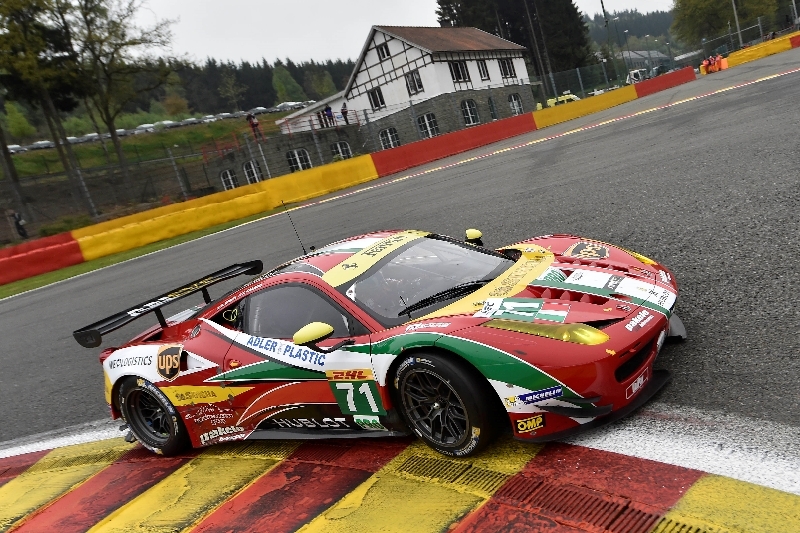 Also taking pole, but in the LMGTE Am class was car 61 in the hands of Mirko Venturi, Luis Perez-Companc and Marco Cioci. 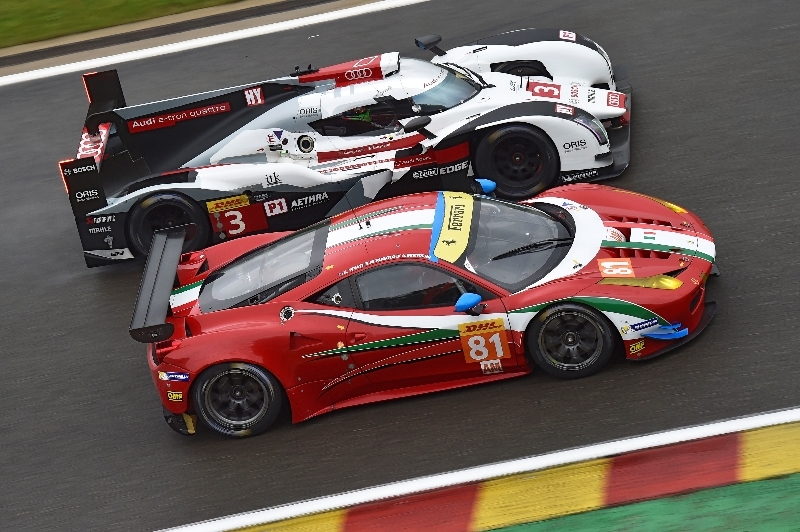 Bruni and Vilander posted a 2.32.338, just under two tenths faster than the Aston Martin of Darren Turner, Stefan Mucke and Bruno Senna and almost two and a half tenths quicker than the Porsche which had won the opening round in Silverstone, crewed by Frederic Makowiecki, Marco Holzer and Richard Lietz. 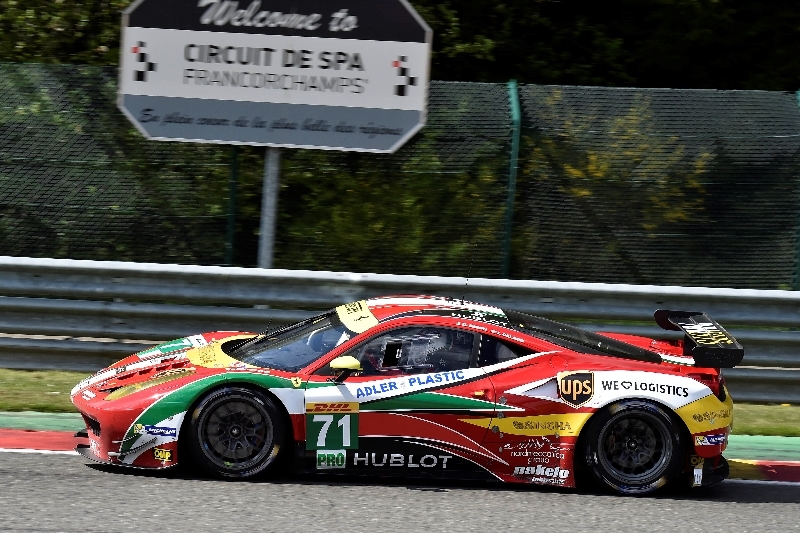 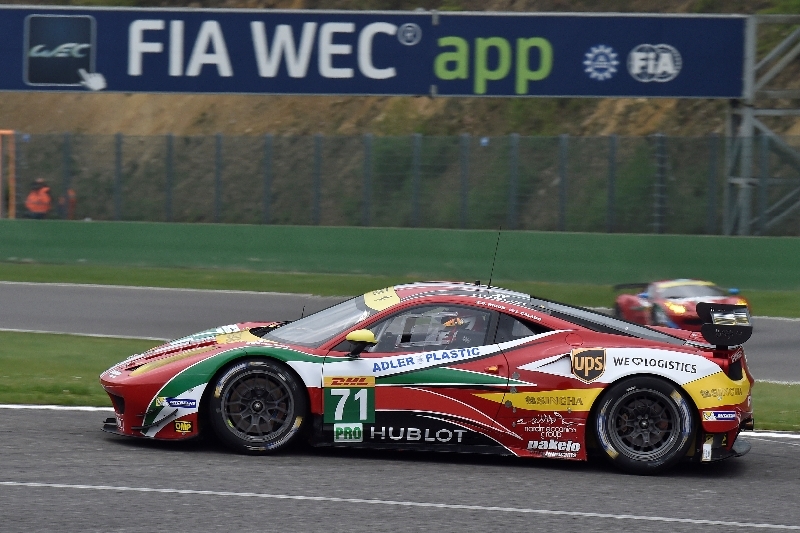 Sixth was the number 71 AF Corse 458, driven by James Calado and Davide Rigon. 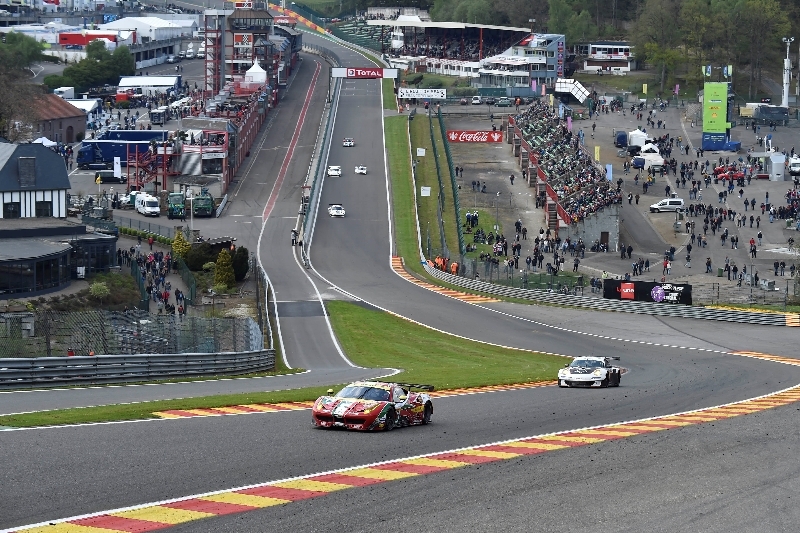 In the LMGTE Am category, Venturi, Perez-Companc and Cioci only just beat by a mere 21 thousandths with a time of 2’33”926, the Porsche entered by Prospeed Competition and was 76 thousandths ahead of the other AF Corse car number 81, entrusted to Michele Rugolo, Steve Wyatt and Sam Bird. 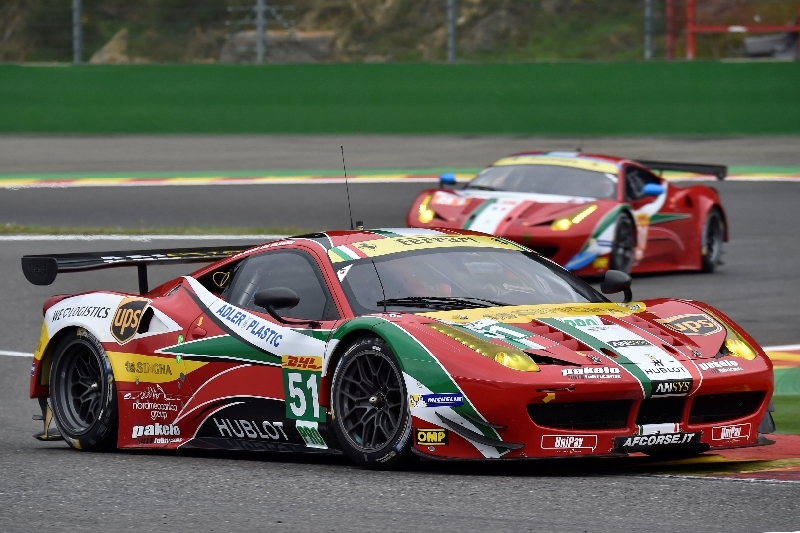 As for the two other Ferraris there was a fifth place for Potolicchio, Roda and Ruberti in the 458 Italia fielded by the 8 Star Motorsports team and sixth for the third AF Corse car, the number 60, driven by Mann, Giammaria and Case. 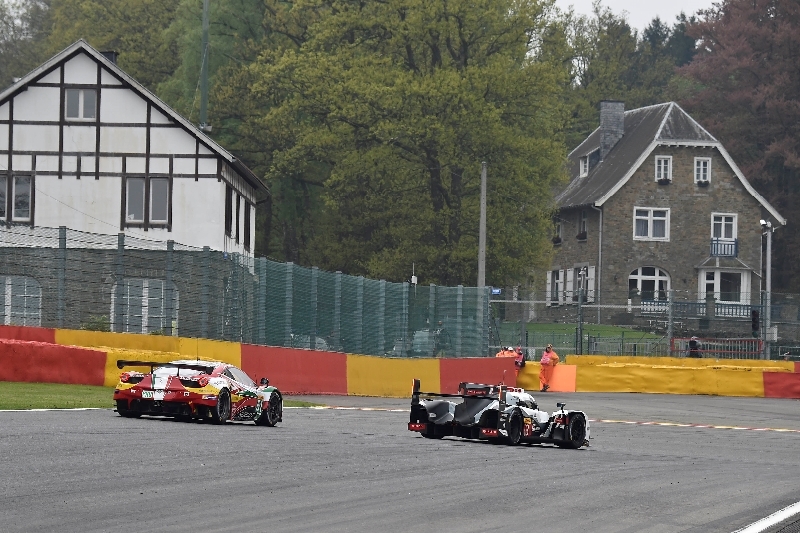 Outright pole went to the works Porsche of Romain Dumas, Neel Jani and Marc Lieb. 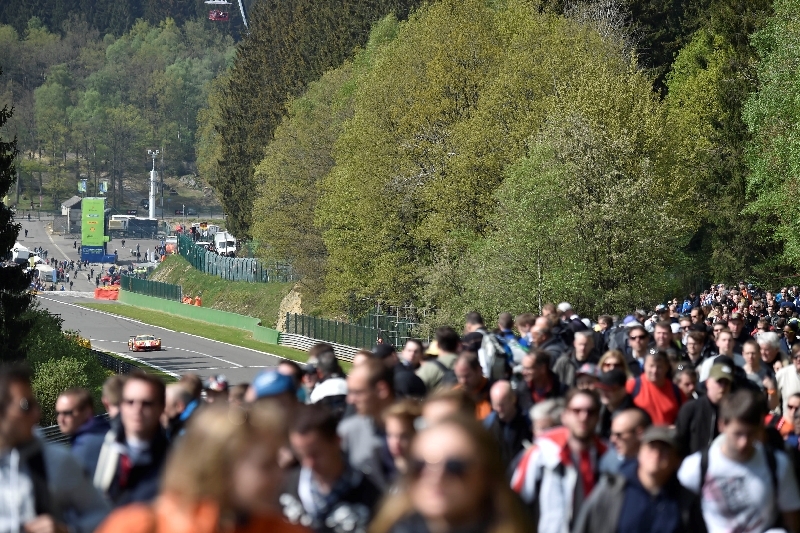 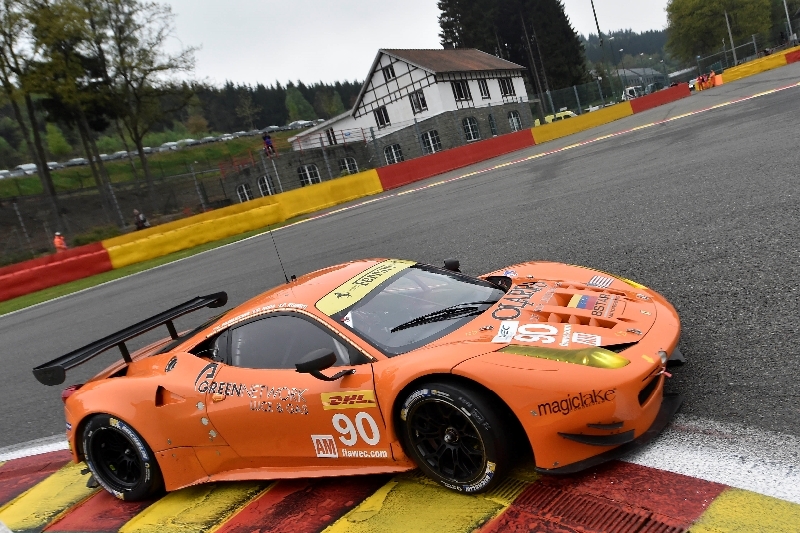 The Spa Francorchamps 6 Hours gets underway tomorrow at 14h30. 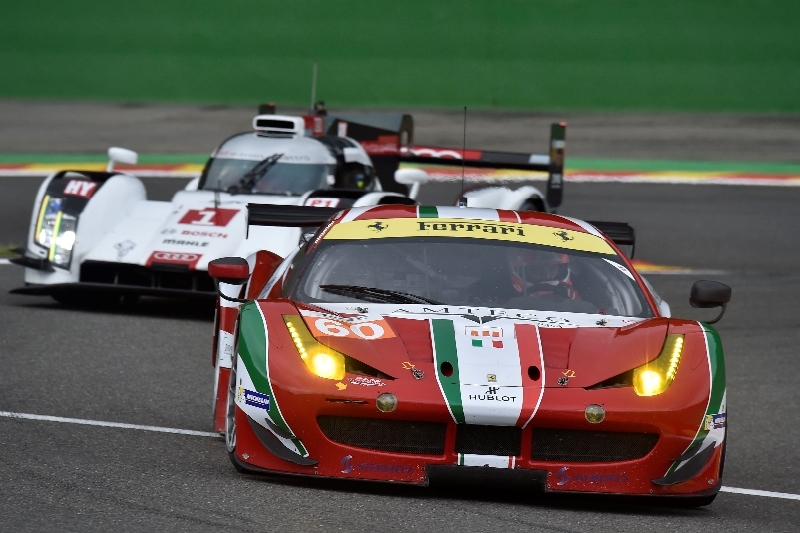 Maranello, 1 May – Two weeks on from the curtain raiser in Silverstone, the World Endurance Championship is back in action for the second round of the season. 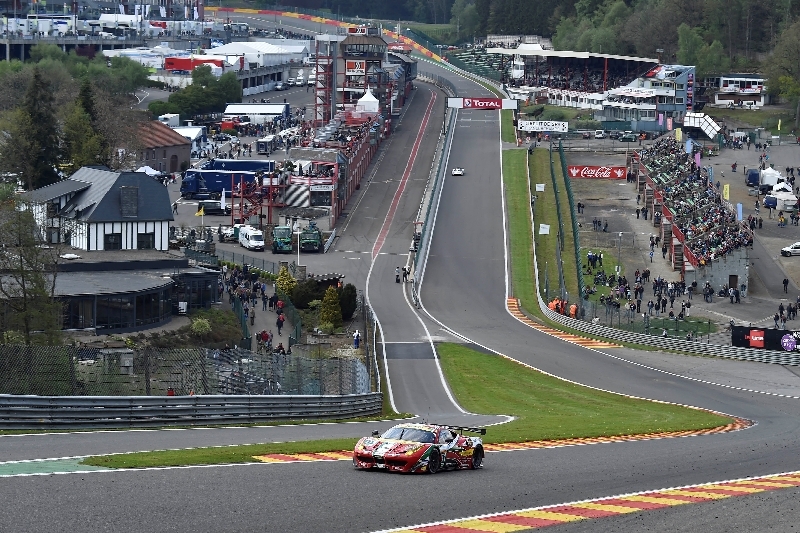 And it’s time for another great circuit, Belgium’s Spa-Francorchamps, which hosts the 6 Hour race on Saturday. 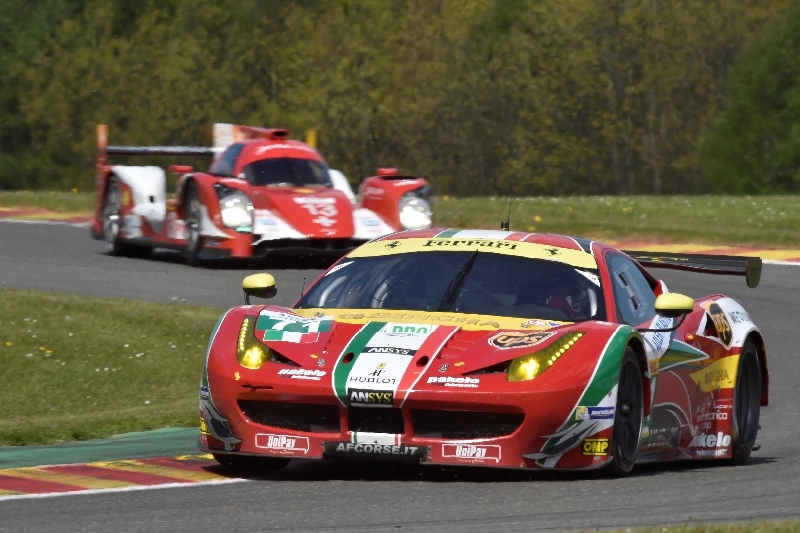 In past endurance championships at this track, Ferrari has won ten times, with six outright victories and four class wins. 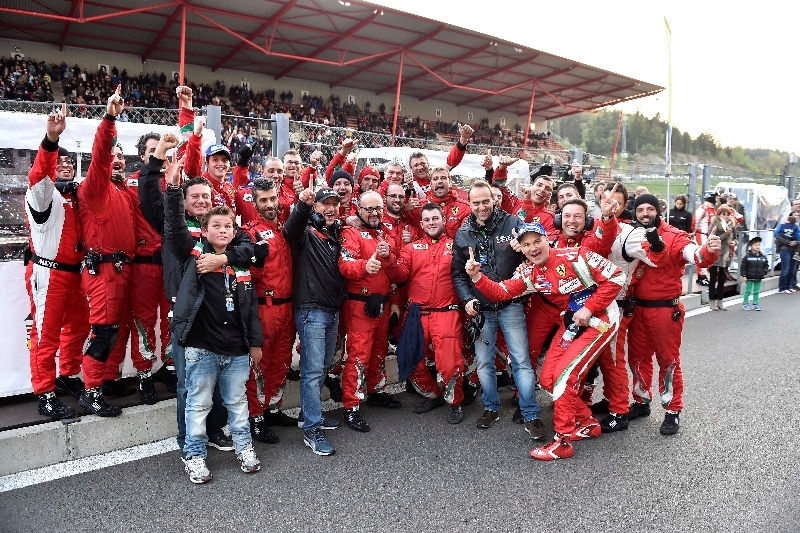 The Maranello marque first won an endurance event here thanks to Mike Hawthorn and Giuseppe Farina, who in 1953, the first year of the relevant world championship, won the 24 Hours at the wheel of a Ferrari 375 MM Pinin Farina Berlinetta officially entered by the Scuderia. 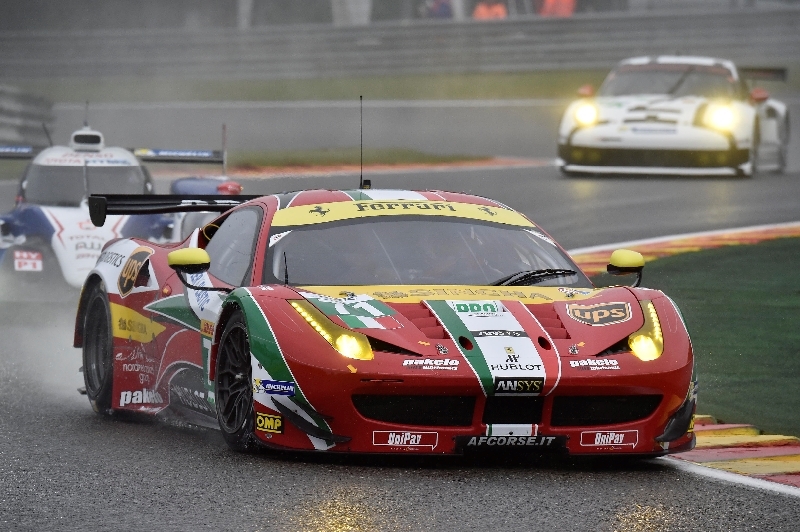 The Ferrari finished ahead of two Jaguars who finished no less than 18 and 29 laps down! 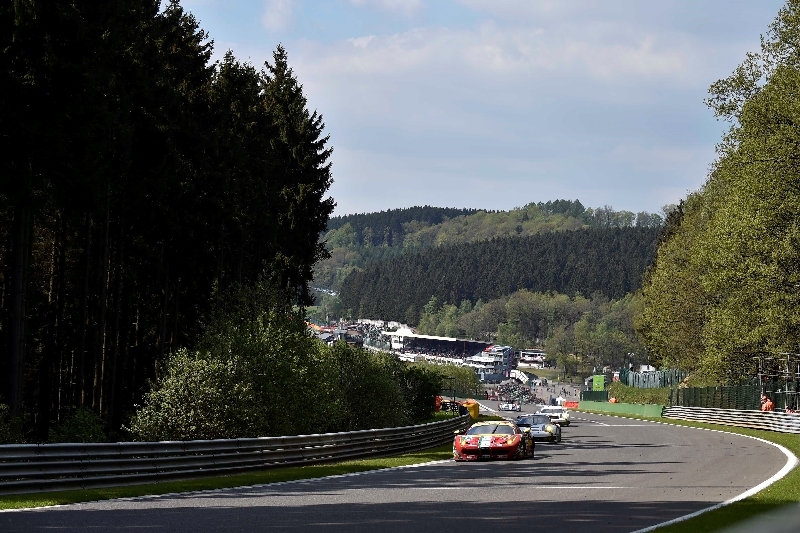 But for even more convincing dominance one had to wait until 1963 when, over 500 kilometres, Ferrari would take a clean sweep of the top five places in the overall standings. 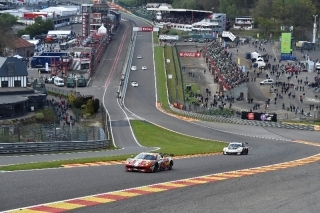 Victory went to Belgium’s Willy Mairesse in a 250 GTO entered by Ecurie Francorchamps. 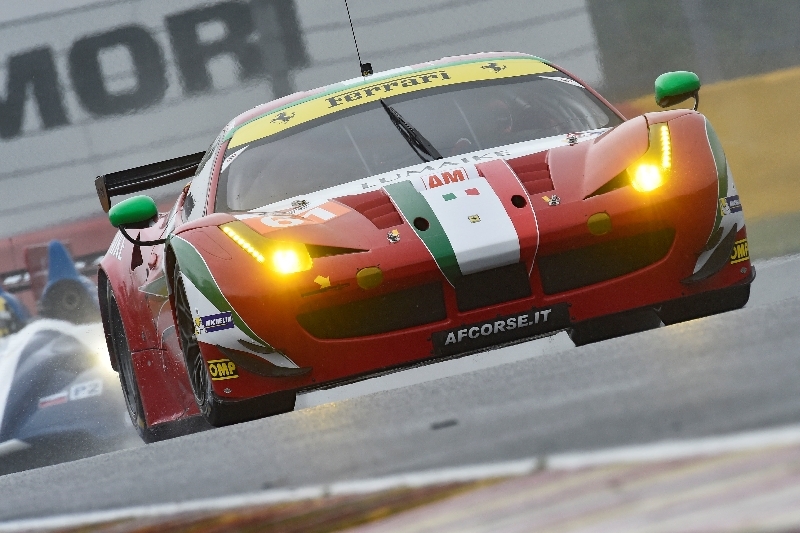 This year, AF Corse’s Ferrari number 51 is aiming to repeat its 2013 win, to immediately make up for the disappointing result at a wet Silverstone. 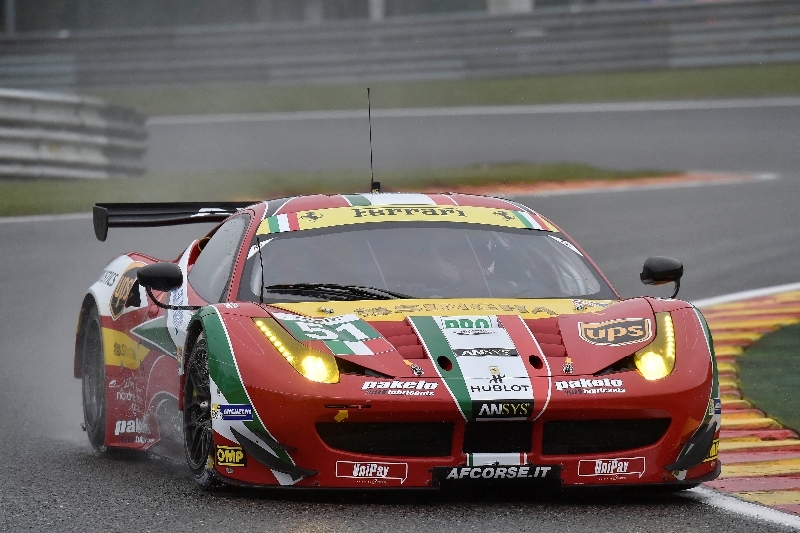 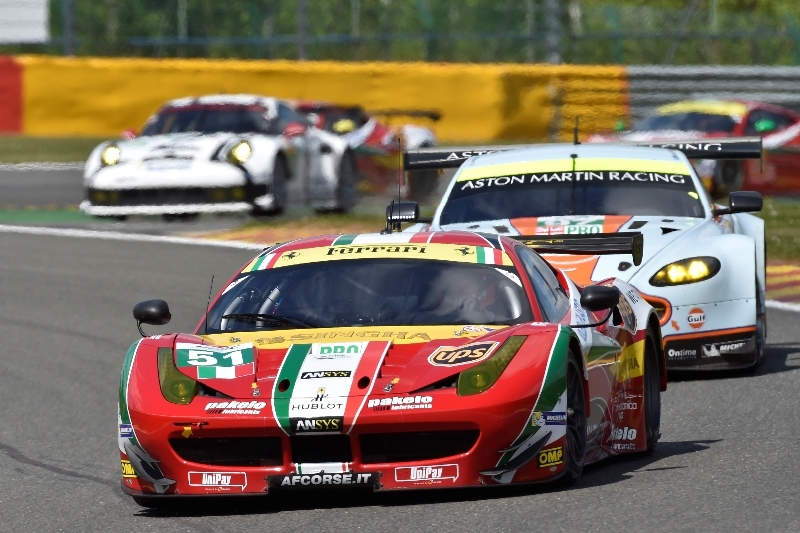 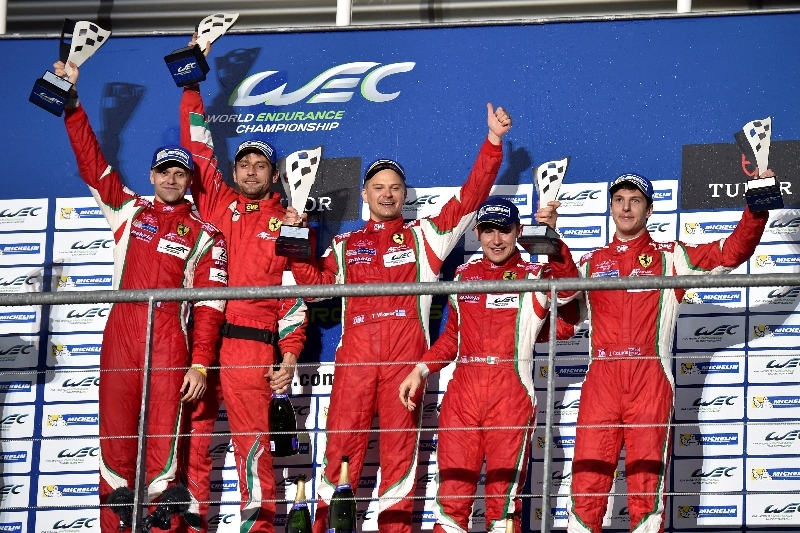 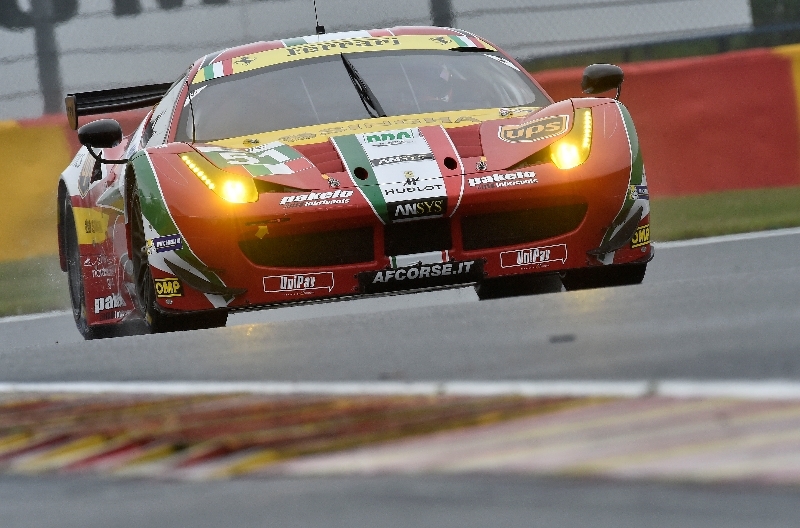 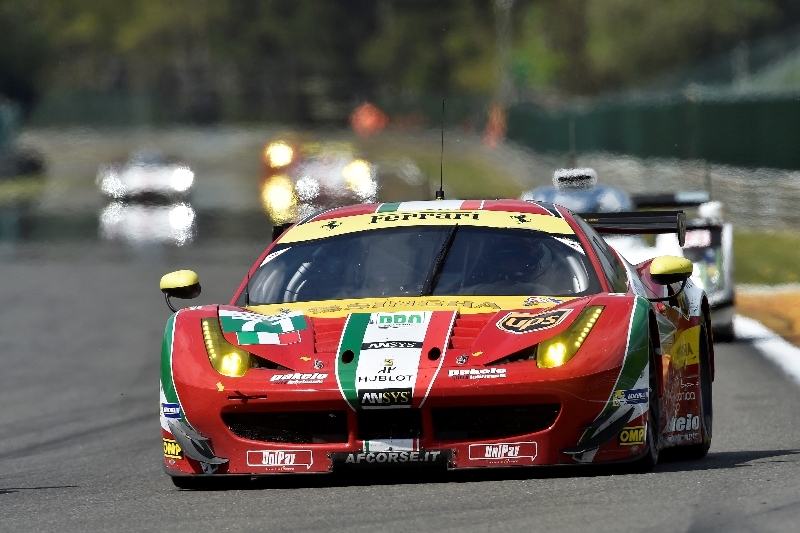 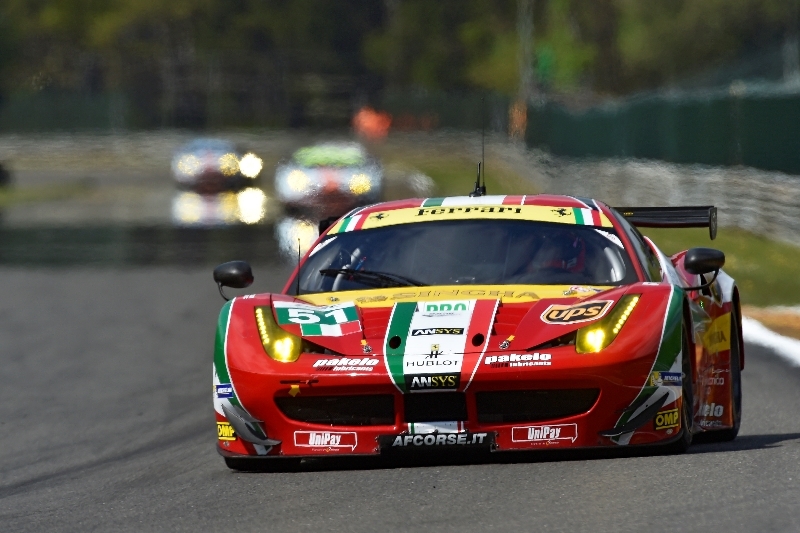 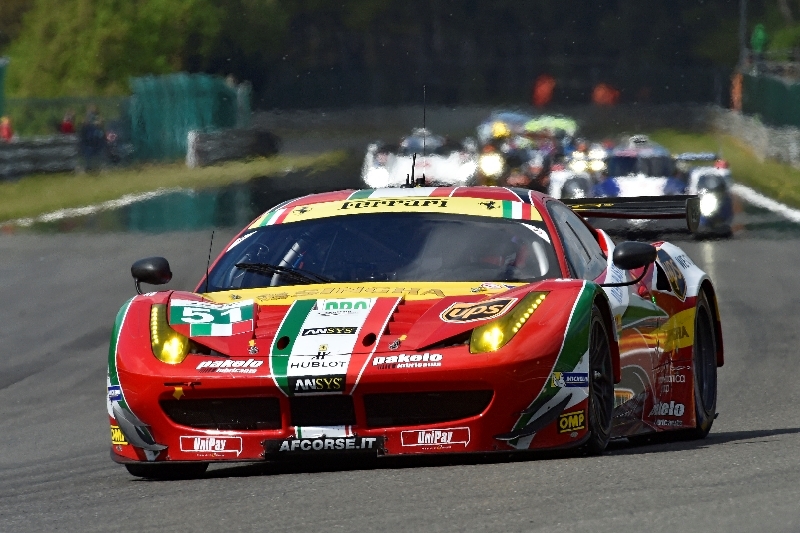 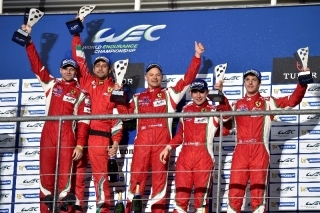 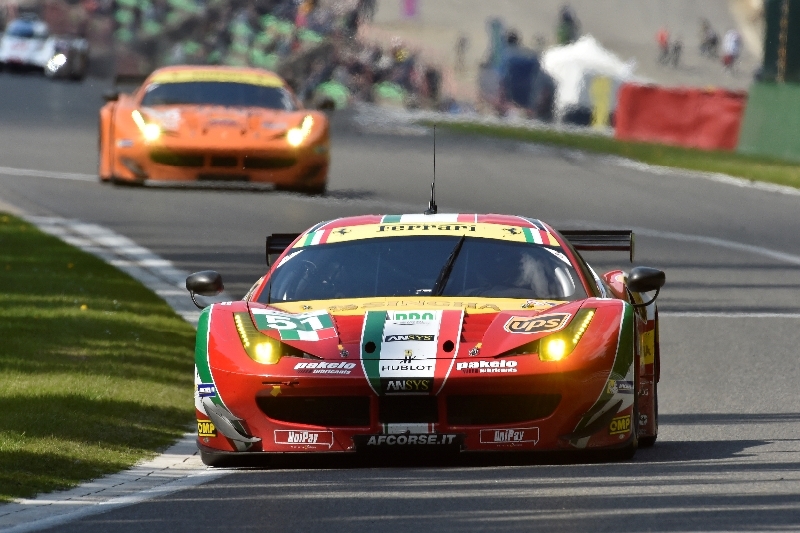 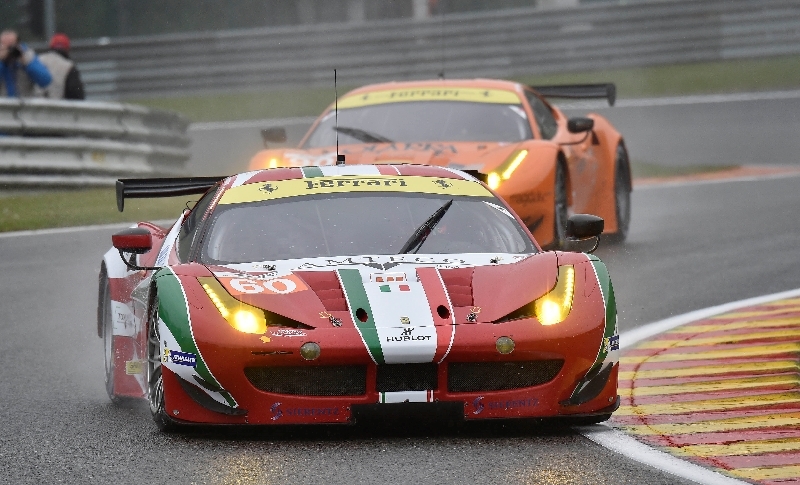 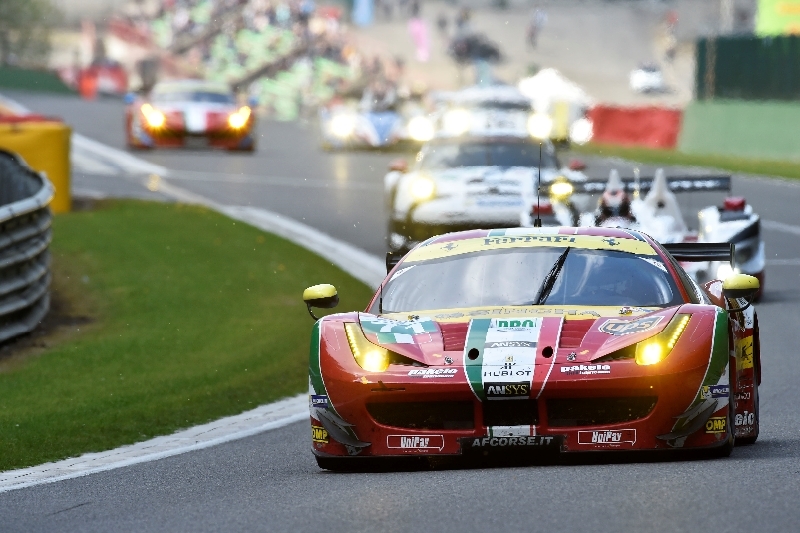 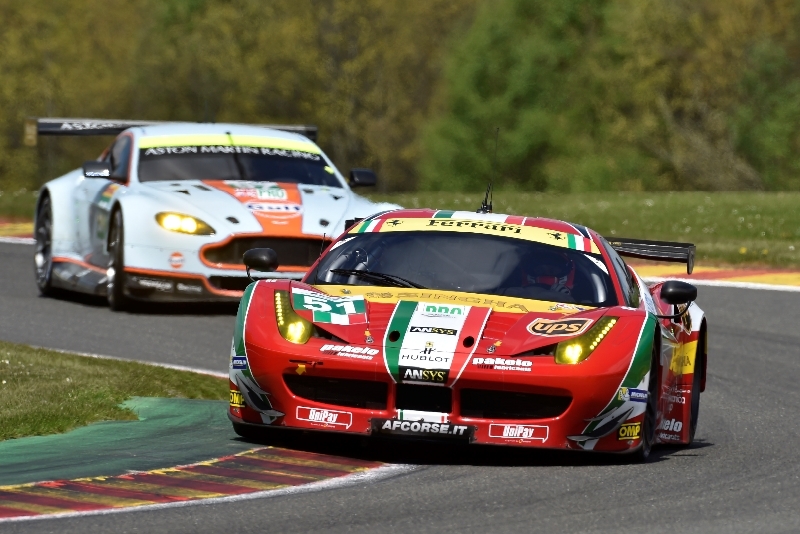 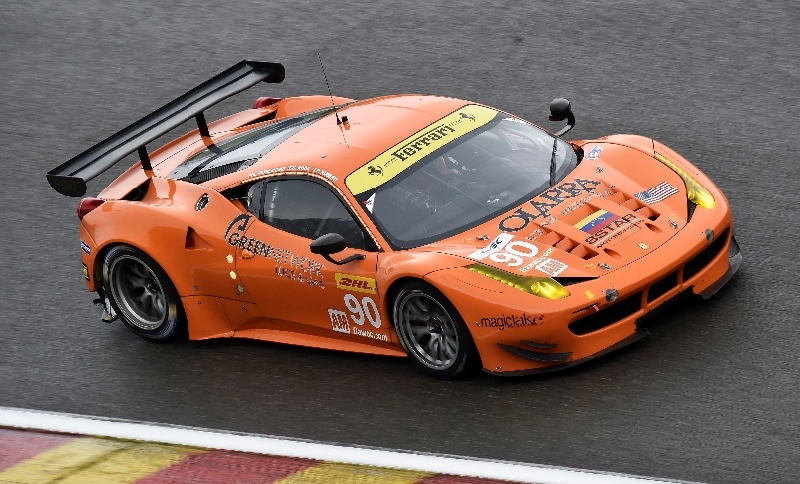 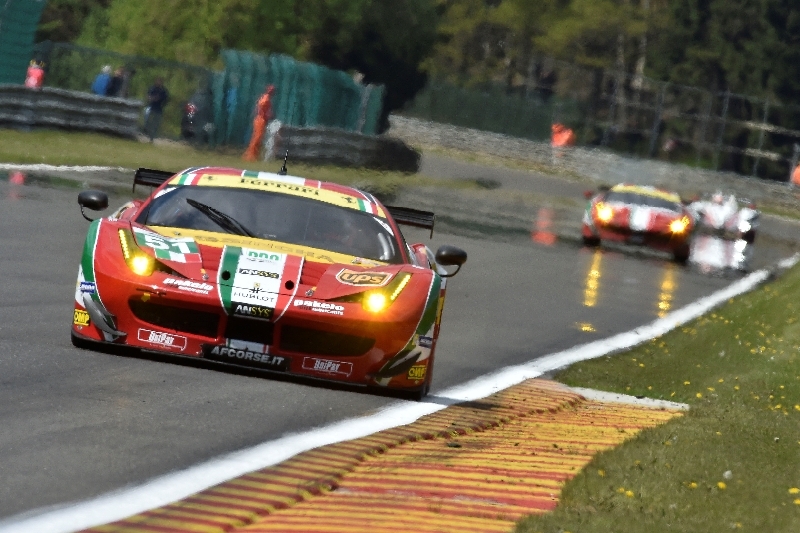 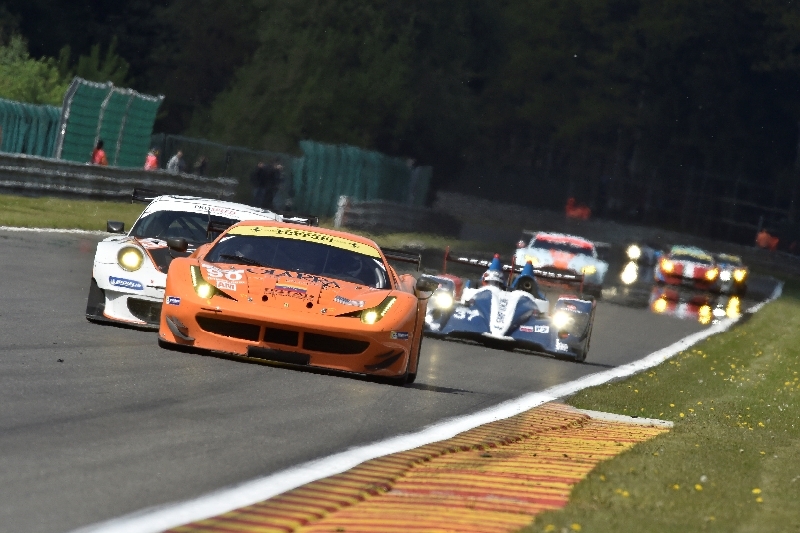 Last year, victory in the LMGTE Pro class went to the driver pairing of “Gimmi” Bruni and Giancarlo Fisichella. 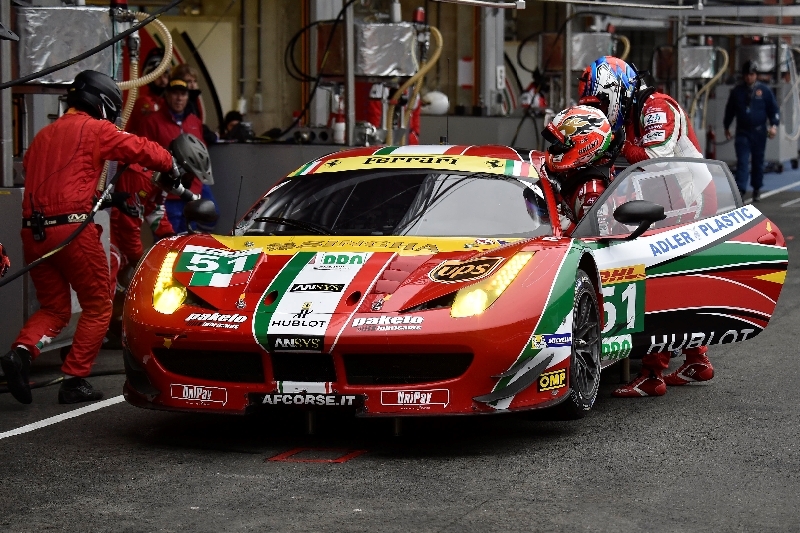 This year, Bruni shares car 51 with the Finn Toni Vilander, who finished third here a year ago in AF Corse’s 71 car with Japan’s Kamui Kobayashi. 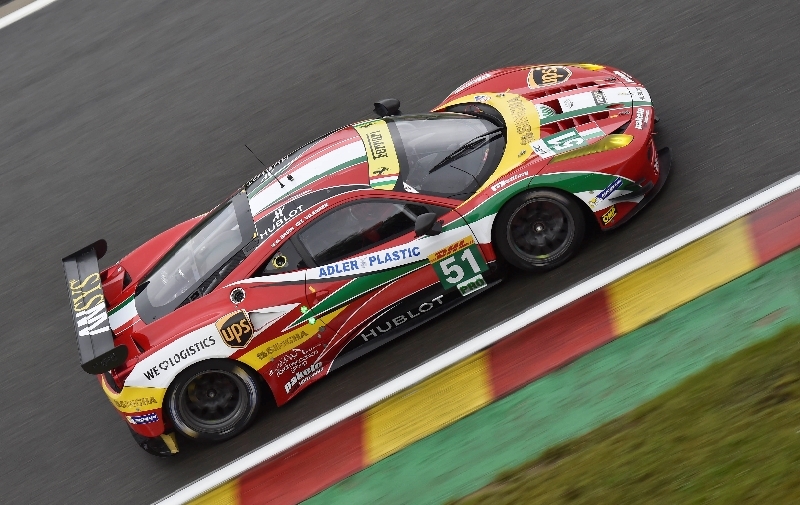 The very same Ferrari 458 will be on track this Saturday, in the hands of talented youngsters James Caladao and Davide Rigon. 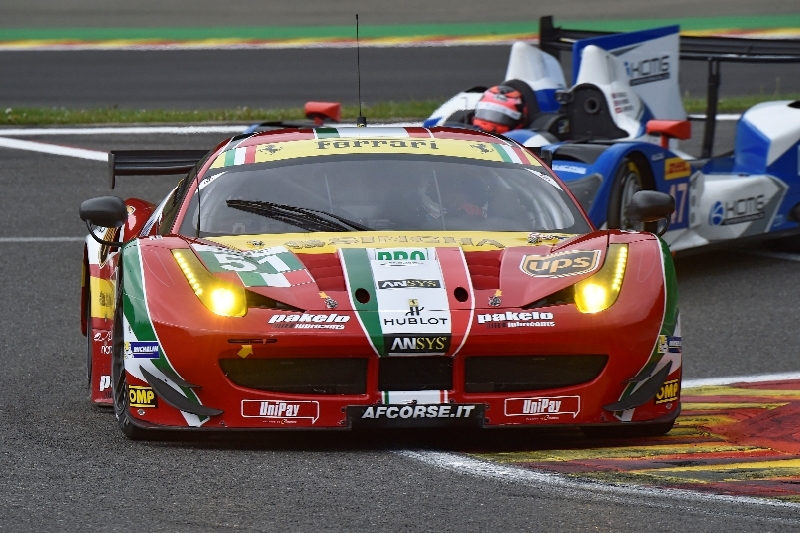 There is one other Ferrari in Spa aiming to keep the crown it won last year. 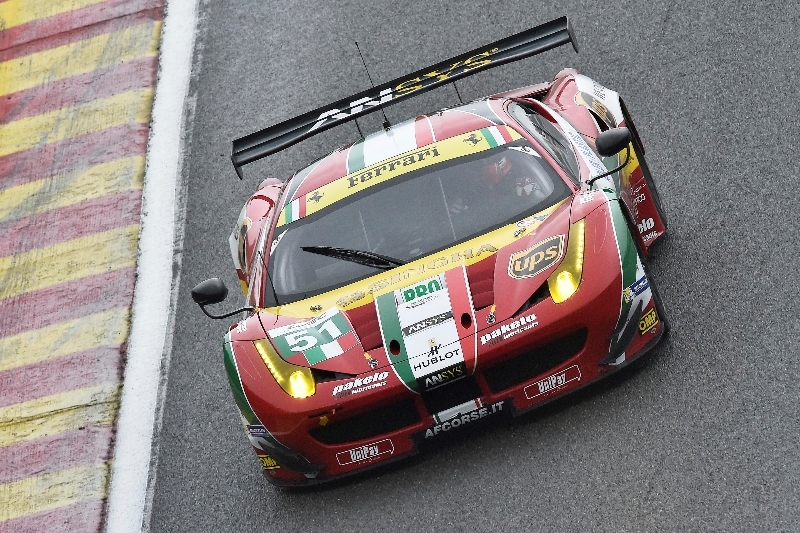 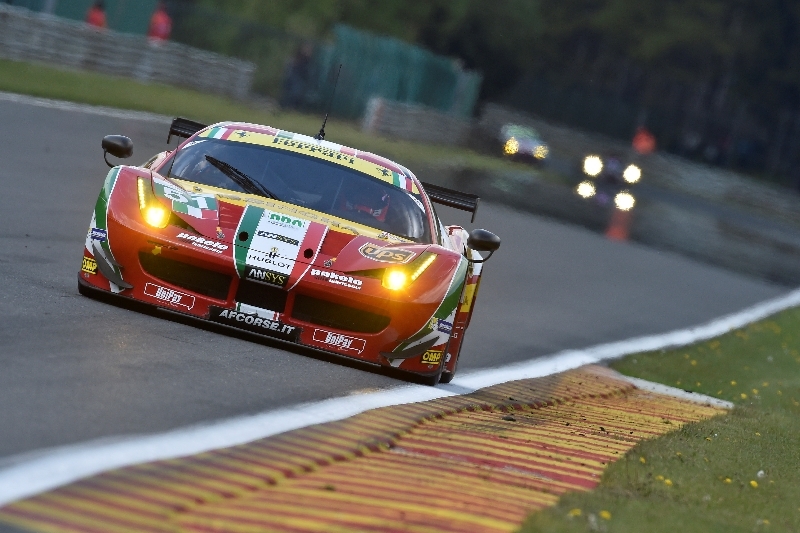 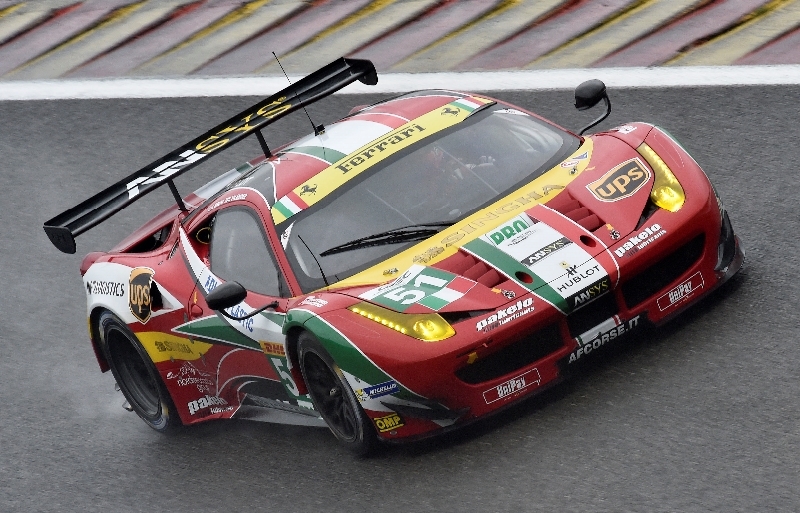 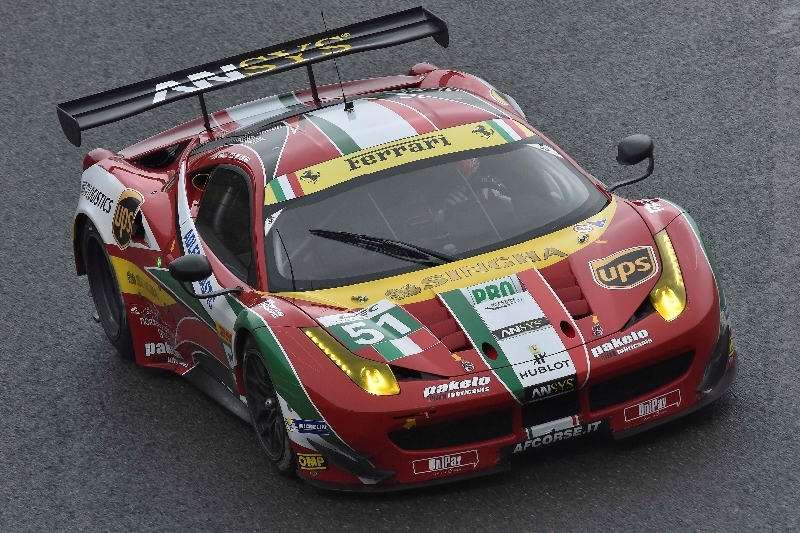 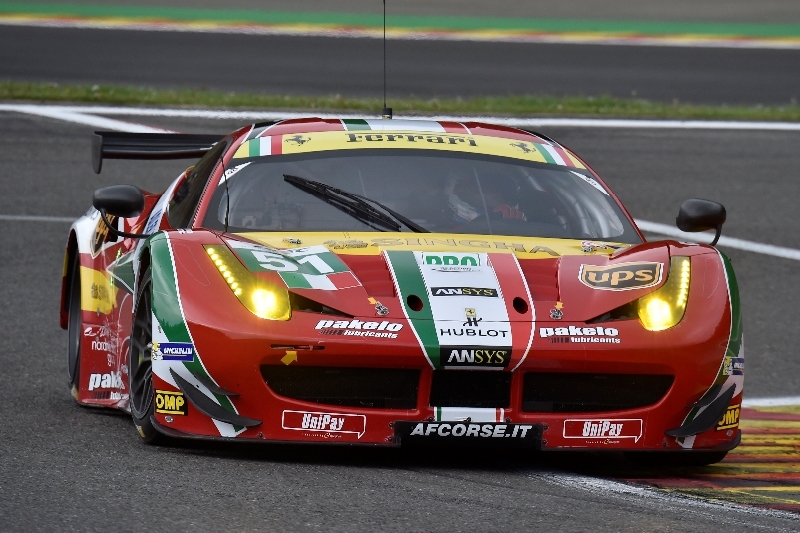 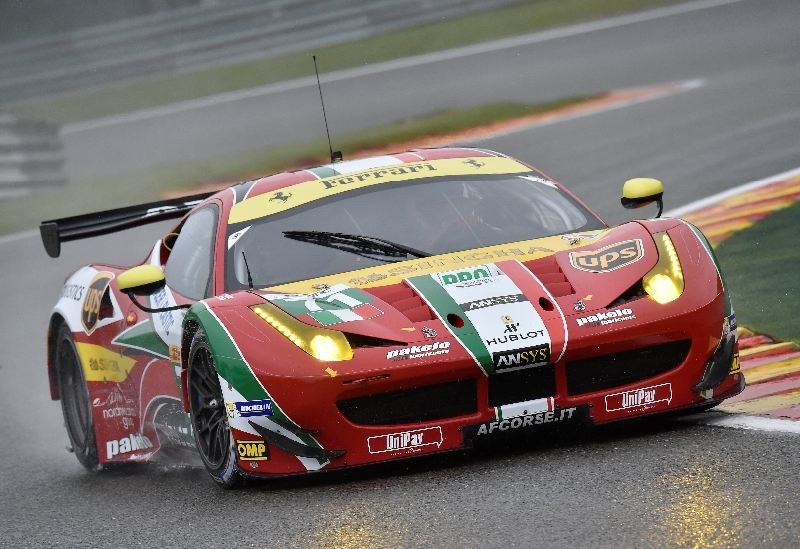 The 8 Star Motorsports 458 Italia won the LMGTE Am category with Enzo Potolicchio, Rui Aguas and Matteo Malucelli. 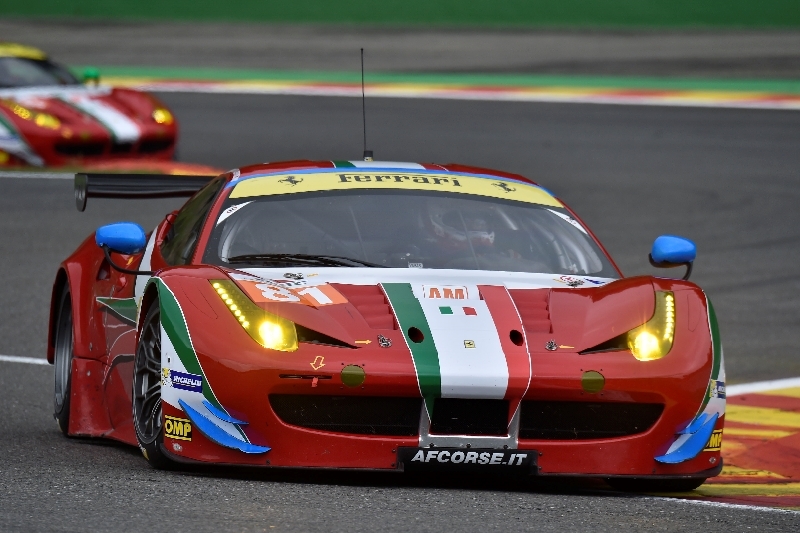 This year, Potolicchio will again be at the wheel of car 90 but this time he shares it with Italians Gianluca Roda and Paolo Ruberti. 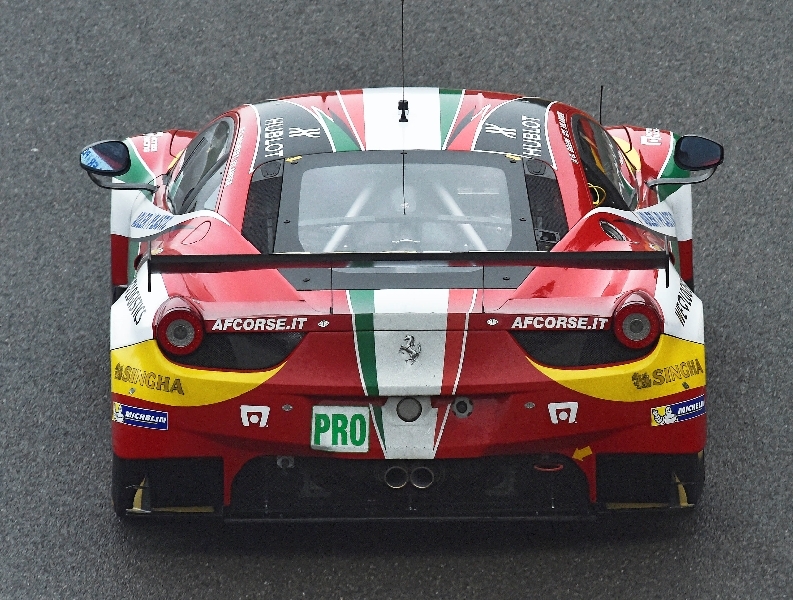 There are three AF Corse Ferraris taking part in this category: car 60 for Peter Mann, Raffaele Giammaria and Lorenzo Casé, number 61 with Luis Perez-Companc, Marco Cioci and Mirko Venturi and the 81 car of Steve Wyatt, Michele Rugolo and Andrea Bertolini.